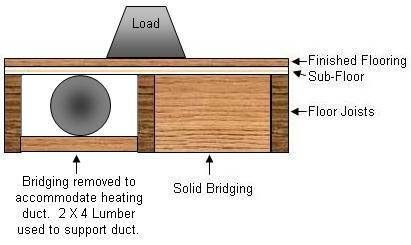 Floor joist bridging is critical to the structural strength of a floor, as shown in Figure 1. Proper bridging distributes the load on the floor to other joists and over time prevents floors from sagging and squeaking do to floor joists twisting and warping. Yet it is not uncommon to find bridging not properly installed or missing all together. Why does this happen? There are a couple of reasons. When cross bridging is used, wood or metal, the upper portion of the bridge is nailed into the top of the floor joist, if it is metal. If it is wood it is nailed to the upper top of the side of the floor joist before the floor or sub-floor is installed on the joists. Attaching the bottom portion of the cross bridging to the joists should be done after the flooring is installed. 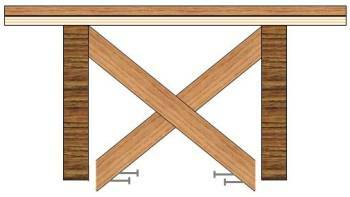 The cross bridging is installed by the rough-in carpenters and the problem is that they have usually left the site before the finished flooring is installed. As shown in Figure 2, it is not unusual, especially in new homes, to find that the cross bridging has not been nailed to the bottom of the floor joists. Bridging is removed to allow for the installation of duct work, as shown in Figure 3, dryer vent pipes, plumbing drains, water pipes, and lighting. 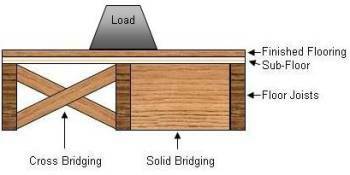 Although not as good as solid or cross bridging, a 2 X 4 supporting the duct work, as shown in Figure 4, would provide more support and load sharing than a light piece of metal. Table 1 provides the correct quantity of bridging relative to the span of the floor joist.